Outdoor kitchens can be perfect for entertaining parties or for a romantic setting for two. Getting started, though, takes planning and homeowners often feel overwhelmed by the magnitude that can come with such an undertaking. Many things in a kitchen contribute to giving this popular room its personality. Appliances and choice of cabinets go a long way toward crafting that look, but perhaps nothing defines a kitchen more than a homeowner’s choice of countertops. Salem Stone design has a wide selection of beautiful stone samples in the showroom and full size materials in the slab yard for you to view. An added perk? Design and fabrication are done locally in Waterford. The Salem Stone Design team is made up of 12 employees whose sole aim is to bring your project the personal attention as well as the premium quality materials it requires. Below are some ideas to get you started. Outdoor kitchen surfaces must be able to withstand New England’s climate. 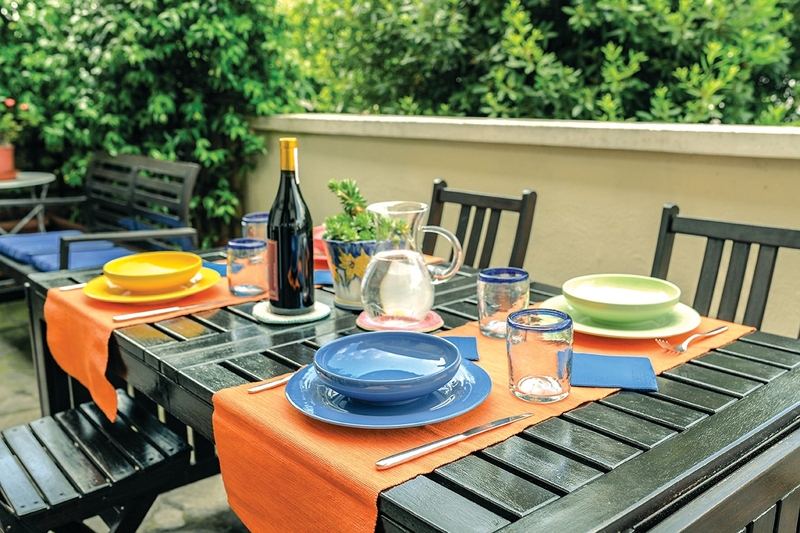 Selecting durable materials such as granite, marble, soapstone, and quartz is vital for a long-lasting outdoor space. Thanks to their unique shading, tones, and natural colors,they complement many different cabinet colors. Make sure all countertop surfaces and hardware are constructed for exterior use and, if you are building on an existing deck, check that it is structurally sound and able handle the weight of your new kitchen. An outdoor space is as important to plan as any room in your home. Would you like to host cocktail parties at the bar area or serve family dinners around an island? Besides the obvious (choosing a grill and countertops) plan for storage and the organization such as pullout trash and recycling bins, and receptacles to hold napkins, glasses, and cleaning supplies. To maximize the hours your outdoor kitchen is available to you, plan for lighting. The sun will set but it doesn’t mean you have to move the party indoors. Overhead lighting is key to making the most of your grilling and eating spaces. As you consider the best fixture for the lighting you also may want to consider an outdoor ceiling fan to keep air moving and increase the comfort level in a semi-enclosed outdoor kitchen space. Before you build your outdoor kitchen, consider the types of cooking surfaces you will want to use, such as a stand-alone range or a smoking grill. Then design your kitchen with the ability to shield those items from the weather when not in use. Most outdoor kitchens don’t have to hold enough food and beverages to feed a crowd for a week—just a meal. That makes it easy to select affordable, small-space appliances that use less energy and take up a fraction of the square footage. Meal cleanup outside shouldn’t require more work than inside. In an outdoor kitchen, choose an easy-to-clean floor, such as tile which is easy to sweep and withstands outdoor messes such as cut grass and garden debris. If your outdoor kitchen will be freestanding, electricity is essential to power items such as lights and appliances. Placing an outlet near the main cooking area will expand the ways you can use the space into the night. Rainy spells, wind, and even extra-sunny days can hamper your use – and enjoyment – of an outdoor kitchen. Make the most of your grilling-and-dining area by covering your kitchen space overhead. Working in an outdoor kitchen can be a challenge if you lack areas to stash everyday necessities. Think through what you want to have on hand to determine what kind of storage you need. If your interior kitchen is not nearby make sure to include cabinets or a cart to store grilling tools, utensils, plates, and serving pieces. Each natural stone material offers unique strengths — from heat resistance to ease of cleaning. Will you have a fire pit? Then including a place to keep your woodpile dry is key. Mixing a variety of materials creates an ideal kitchen area: the handier it is to cook and entertain in your outdoor kitchen, the more you will take advantage of it. There are few things more tiresome than having to traipse back inside from an outdoor kitchen in order to wash your hands or meal items. Natural stone will enhance your signature style and complement integrated sinks, backsplashes and edge options. Try to include even a small bar-size sink, next to the grill. Salem Stone works with architects, cabinetmakers, contractors, and homeowners who want to do it themselves. Salem Stone specializes in custom stone services, so they can do virtually anything needed in a custom surface – engineered quartz, marble, granite, soapstone, exotics, you name it. In addition to kitchens, stone surfaces work well in bathrooms, living spaces, and outdoor areas for countertops, bar tops, spas, outdoor showers, fireplace surrounds, and furniture tops. Stop in today, talk about your ideal project and explore the possibilities for your own backyard. Salem Stone Design is located at 18A Industrial Drive, Waterford, CT 06385. Call 860-439-1234 or visit salemstonedesign.com/ to learn more.